Home > Products > ChargeIt by Jay Royal White Antique Charger Plate 13"
This item will be back in stock August 30th. Order now to reserve. 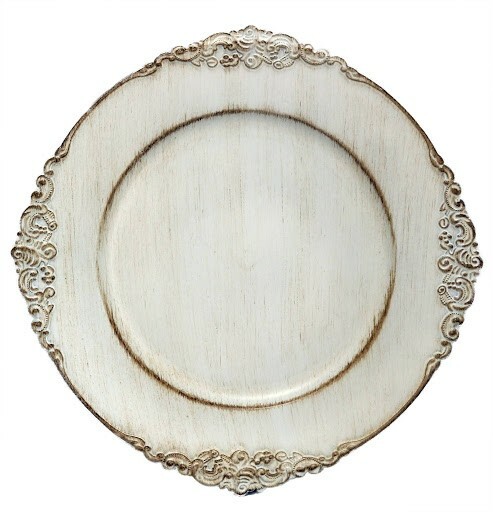 Provide a sophisticated and elegant backdrop for your upscale dinnerware with the ChargeIt by Jay Royal Antique Cream Acrylic Charger Plate 13". Featuring an embossed ornate accent with an elegant, vintage appearance, this one-of-a-kind charger plate adds a timeless touch to any setting. Thanks to its high quality acrylic construction, this charger boasts superior craftsmanship for exceptional toughness and durability. Perfect for lavish parties, wedding receptions, and fine dining restaurants, this charger plate is perfect for multi-course meals and also provides protection against spills and mess. To clean and maintain this charger plate, hand washing is highly recommended.